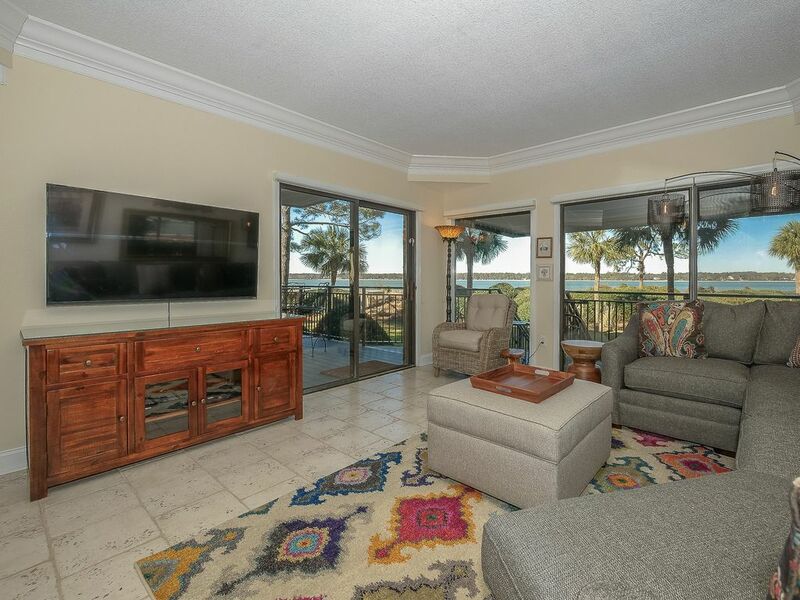 Beachside Tennis Oceanfront Complex ~ Just Steps from the Beach! 1848 Beachside Tennis is a newly renovated first floor, two bedroom, two bath vacation villa located in South Beach within walking distance of South Beach Marina. This villa is just steps away from the beach. The open and airy floor plan offers beautiful views of the Calibogue Sound from every room. The fully equipped kitchen has beautiful cabinetry, new appliances and a breakfast bar that seats four. The adjacent dining table seats four also. The living room has plenty of comfortable seating, a large flat screen TV and a sliding glass door leading to the spacious balcony. The covered balcony has a table with four chairs and steps leading down to the pool and beach. The bedroom has two queen beds, flat screen TV and a large walk-in closet. The bathroom has a double vanity and a terracotta tile shower. A large beachside swimming pool and grilling area are available to guests. Located in the highly desirable South Beach Marina area, this villa is just a short walk to the famous Salty Dog Cafe, shopping, dining, boating, and nightly entertainment. Perfect for a week's vacation or a quick get-away weekend, guests will be sure to revel in the breath-taking sunsets and peaceful setting of Beachside Tennis Villas.